You can customize the domain your knowledge base is hosted on, as well as the appearance of your knowledge base. In the lower-right, click Advanced options, then click to toggle the Display system domains switch on to include your system domains. In the Primary domains section, locate the row for your Knowledge base, then click the Edit dropdown menu and click Replace primary domain. In the dropdown menu, select an existing domain or connect a new domain in HubSpot to select it here. Knowledge Base root URL: to add a subdirectory to your subdomain for your knowledge base (e.g., info.mywebsite.com/knowledgebase), enter it in the Knowledge Base root URL field. Language: your account settings will carry over by default, but you can select a custom language for your knowledge base using the dropdown menu. Support form: add a support form for your visitors to your knowledge base. Learn how to set up and add your support form to your knowledge base. Favicon: the small image that appears in the browser tab. Company logo: your knowledge base logo image. Name your knowledge base: the public facing name of your knowledge base e.g., Help Center or Knowledge Base. Text link to your support form: this text will appear in the upper-right corner of your knowledge base and link to your support form, if the support form is set up. Company website URL: your company website URL, which will link to your logo image. Text link to your company website: this text will appear in the upper-right corner of your knowledge base and link to your Company website URL. Welcome message: displays above the search bar on your knowledge base home page. 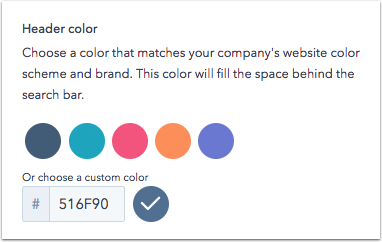 Header color: select a color bubble or use the color picker to enter or select a custom color. This color will fill the space behind the search bar. Header background image: in place of a Header color, you can upload your own background image to fill the space behind the search bar. Click Browse images to choose an image from your file manager, or click Upload to select a new image from your computer. Links: this color will be used for any text links throughout your knowledge base. On the left side of your Customize settings, you'll see a live preview of how your knowledge base will appear on different device types. Click the tabs to adjust the preview and see how your knowledge base will appear on different device types. This preview will update with all your changes in real time. At the end of every article, visitors are asked to give feedback on the article by selecting Yes or No. Each submission is added to your article health data in your knowledge base reports. When a visitor leaves feedback, they are asked for their email address. 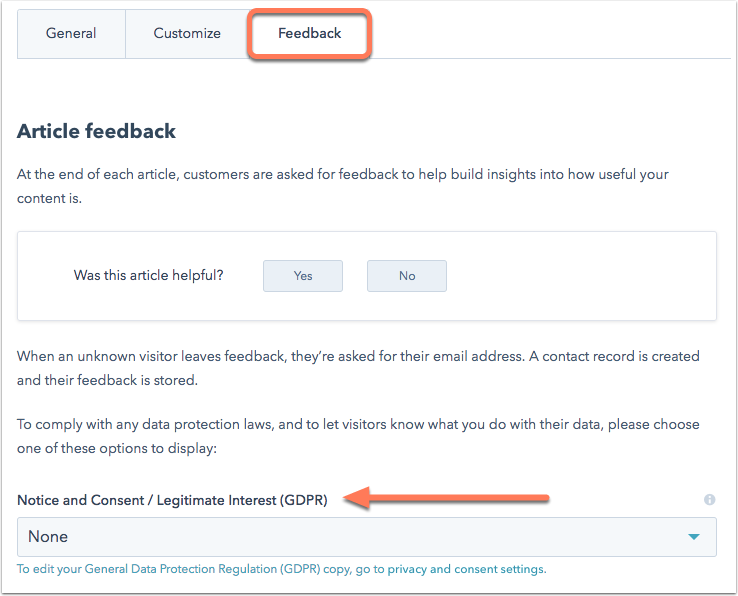 To comply with any data protection laws and let visitors know what you do with their data, click the Feedback tab. Click the Notice and Consent / Legitimate Interest (GDPR) dropdown menu and select an option.